About one in 10 U.S. owners of an iPhone or other iOS device are currently using Apple Music, the Cupertino, Calif. company's streaming service, according to a survey conducted by MusicWatch. 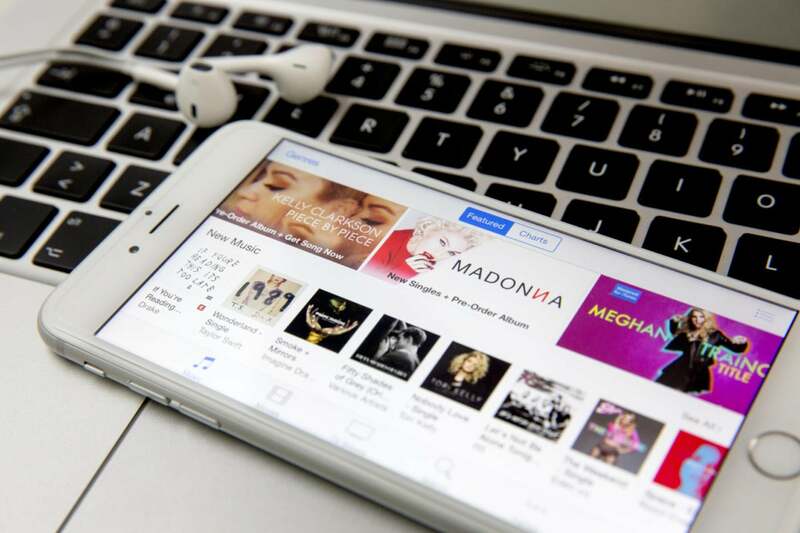 But nearly half of those who have tried Apple Music -- which offers a free three-month trial -- have stopped using it, said MusicWatch, a research firm based in Huntington, N.Y. that specializes in the music industry. Apple disputed MusicWatch's numbers. According to a company spokesman Thursday, 79% of the those worldwide who have signed up for Apple Music's trial continue to use the service. Earlier this week, MusicWatch, citing the results of a survey it conducted this month of 5,000 U.S. consumers, contended that just 11% of all domestic iOS users were now using Apple Music. "Actually, I was surprised, given all the run-up to Apple Music," said Russ Crupnick, a managing partner at MusicWatch, in an interview. "I thought the [11%] would be higher." So did Jan Dawson, chief analyst at Jackdaw Research, who last week parsed Apple's Aug. 3 claim that globally it had signed up 11 million customers to Apple Music since the June 30 debut. "Eleven million is only about 2% of [the 500 million iPhone users worldwide], which makes for a tiny conversion rate," Dawson wrote in a piece published on Tech.pinions (subscription required). Both Crupnick and Dawson were nonplussed by the low number, whether the 11% using Apple Music in the U.S. (Crupnick) or the 11 million Apple touted worldwide (Dawson). After all, the service doesn't cost users a dime until their three-month free ride ends. "It's a free, low-risk endeavor," said Dawson in an interview today. "Yet they have this very, very small number who have bothered to try it out." Crupnick and Dawson each cast for reasons why fewer iOS owners -- the prime audience, although Apple Music can also be accessed by Mac and Windows users -- than expected had taken to the service. One possibility, both said, is that interest in music streaming had been grossly overestimated. "This whole concept is relatively new to most people [in the U.S.], and is still getting traction," said Crupnick. "Is this an indication that the market for streaming is very, very small, that it's not much bigger than Spotify has signed up?" asked Dawson, who pegged Spotify's global paid subscription base at 20 million. Or is it because of the way that Apple presented the service? That was Dawson's impression. In his analysis on Tech.pinions, Dawson criticized the Apple Music sign-up process, which he argued featured "a whole series of screens users had to work their way through, many of them emphasizing the payment and subscription elements," then required customers to click a "Buy" button even though they wouldn't pay for three months. "That was a bit odd for something that you wouldn't pay for immediately," Dawson said. Apple took that approach for good reason, Dawson continued, noting that the company linked the Apple Music trial to the customer's credit card already on file with iTunes. By making those who signed up for the trial later opt out to avoid charges to their cards -- when the three months ends, the $9.99 (individual account) or $14.99 (family plan) fees automatically begin -- Apple will certainly boost the retention rate. "That's a higher barrier for a trial," Dawson said of the get-the-card-up-front approach, but added that getting payment information was usually the whole reason for a freebie. In a way, Crupnick agreed. When asked to square the circle between two conflicting survey results -- 64% told MusicWatch that they were extremely or very likely to subscribe, even as 61% said they'd already turned off the auto-renewal option in iTunes -- Crupnick said that users were simply being cautious. "I have a theory on that," said Crupnick. "From Day 1 there were a lot of people talking about how to turn this auto-renewal off. I think a lot of people turned it off even before experiencing the service." In that scenario, many of those who had disabled automatic renewal would end up paying at the end of their trials. Just as important to Apple Music's fortunes, though, has been its apparent inability to become consumers' first choice for listening. By MusicWatch's poll, just 48% of those in the U.S. who had tried the service were still using it. That signaled a significant churn rate, which atop the relatively small portion of iOS owners who give Apple Music a shot, speaks to problems in unseating rivals like Spotify, something many analysts simply assumed would occur. But Crupnick preferred to see the sunny side. "If you look at the penetration of iOS in the U.S., there's a lot more opportunity for Apple," he said as he also stressed the need to put Apple Music in market context. If Apple pulled the bulk of its current U.S. users of Apple Music onto the paid rolls, it would instantly double the 10 million who now pay for a streaming service here. "It's where you set the bar. If you were expecting a large percentage of all iOS owners, well then, it's a disappointment. But if Apple Music doubles the number of paid people, it's a home run," said Crupnick.